Eight Namegiving races dwell in the land of Barsaive, each with its own culture and traditions. Despite their differences, they are bound by shared experiences, beliefs, and love for their land. The stout and stubborn Dwarfs, the spiritual Elves, the versatile Humans, the ancient Obsidimen, the passionate and savage Orks, the fierce and honourable Trolls, the flamboyant T'skrang, and the mischievous Windlings: together they embody the heart and soul of Barsaive. 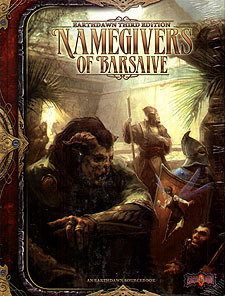 The Namegivers of Barsaive book details the eight Namegiver races and provides extended game information, including new Disciplines, talents, knacks, and goods and services, as well as special rules for playing each race in your Earthdawn Third Edition games. Requires use of the Earthdawn Player's and Gamemaster's Guides.